Do you know your credit score? What about your pet? Does it have a score? Today, I am talking to John Bradford, the “Pet Guy.” John came up with the idea for PetScreening.com by combining his skillsets of being a property manager and pet lover. There’s two “Ps” that cause property damage – people and pets. Property managers need to know how to handle pet diligence and the increasing population of “assistance” animals – sometimes involving pet owners who try to circumvent policies of property management firms. [05:00] Service animals is a topic that sparks property managers’ interest. [07:00] Experience Share: Tell your experiences and don’t hold back any punches. It makes for authentic and real conversations. [07:16] John started PetScreening to develop a service that reduced the liability for property managers and clients. [08:12] John did not want the service to cost any money. [08:21] John loves money, so he wanted a product that generated substantial revenue around pets. [09:05] John worked with software developers, lawyers, veterinarian consultants, lawmakers, and others to develop the PetScreening product. [10:09] Hundreds of firms have registered with PetScreening. [10:55] PetScreening generates revenue through an application fee paid by the pet owner. The cost is $20 for the first pet, and $15 for each additional pet. However, there is no application fee for service animals. [11:40] PetScreening does a revenue share with the property management firm. The tool is free, and they get a rebate besides. [12:17] The property management firm is given a unique link to share with customers who have a pet or service animal for PetScreening to track applications. [13:09] The customer is taken to PetScreening to complete the application, which includes questions about the pet: Name, breed, type, photos, vaccination records,etc. [13:47] The application includes an Affidavit section, which features questions that protect the property manager and owners. Applicants attest and certify their answers are accurate. [15:12] PetScreening developed an algorithm that takes data points from the application to create a “Pet Score” that goes to the housing provider. [15:33] The score can indicate risk factors for that pet. Use that score to create a pricing matrix that correlates to the score and identify how much revenue you will generate. [16:17] Applicants basically know their answers will impact whether a property manager will allow their pet, but they don’t know the pet is being scored. [17:00] Property managers are building better relationships with pet owners because they tell them what they need for the pet owner to pay less. [17:52] The best rating – a 5-paw score – is difficult to achieve. Only about 11% of applicants reach this status. [18:09] It’s up to the property manager how they treat the scoring. If you have an animal with a 1-paw score, you may not allow them or charge more. [18:59] About 10% of PetScreening’s applications are for assistance animals, either as a service or companion animal. [19:53] PetScreening collects data and asks HUD questions, then its legal team reviews each assistance animal application, but no score is given. They are either recommended or not. [20:39] About 32% of applicants who say they have an assistance animal have a status of “waiting for animal owner.” When asked for clarifying information, they disappear. [21:40] PetScreening is disrupting the industry because it is weeding out people who do not truly have an assistance animal. [21:57] Test of Reasonableness: Is the documentation reasonable? When was the document issued? Who is the provider? [22:38] If applicants lie, there is no real legal recourse. There are not a lot of statues on fair housing, so people are taking advantage of this problem. [23:55] PetScreening is a timesaver – and time costs money. John’s firm has saved time and minimized liability risks. [25:09] Every question asked in PetScreening’s application is designed to protect property manager and owners. [25:20] PetScreening developed the first nationwide database where property managers can report incident reports of pet damage and pet biting that follow that animal forever. [26:58] For one, specific pet, the owner only has to submit an application and pay once. Then they can share that information with other businesses. [28:37] However, pet owners need to renew the application every year, which costs $10. 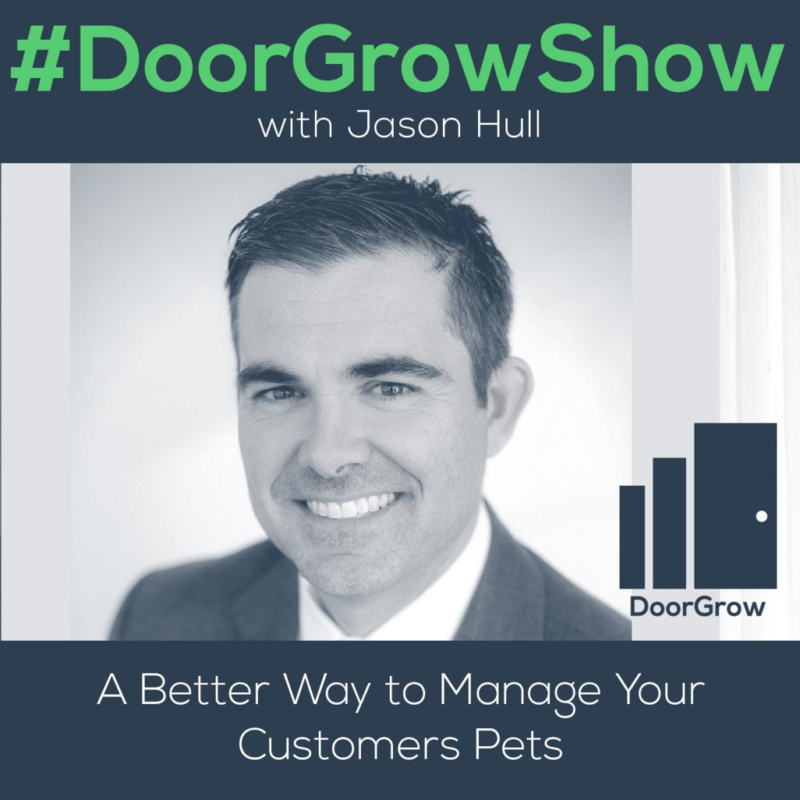 [29:29] Property managers should re-evaluate data because a lot can change with pets. [30:10] HIPAA protects sensitive medical documentation. Property managers can ask for such documentation about assistance animals. [30:42] PetScreening has HIPAA-compliant servers to protect the documentation. PetScreening - a win for property managers, pet owners, and property owners. PetScreening’s database offers incident reports of pet damage and pet biting. It’s up to the property manager how they treat the pet scoring. Jason: We are live. Welcome DoorGrow Hackers to the DoorGrowShow! If you are a property management entrepreneur that wants to add doors, make a difference, increase revenue, help others, impact lives, and you are interested in growing your business and life, and you’re open to doing things a bit differently, then you are a DoorGrow Hacker. At DoorGrow, we are at a mission to transform property management businesses and their owners. We want to transform the industry, eliminate the BS, build awareness, expand the market, and help the best property managers win. If you enjoy this episode, do me a favor. Open up iTunes, find the DoorGrow show, one word, subscribe and then give us a real review. Thank you for helping us with that vision. I am here today hanging out with John Bradford. The man, the myth, the legend, and he’s going to be sharing with us petscreening.com. John, welcome to the show. John: Thank you Jason, great to be here. Jason: John, getting into this, I would love to hear about how you decided to become the Pet Guy. I saw your email signature, I loved it. What does it say? John: Woofs regards, that’s right. Jason: Pet lover, and yes. You’re all on board with pets. I’ve got my two dogs sitting here next to my backpack on the floor, snuggling with each other. How did you decide to get into doing this pet screening idea? John: Great question. I have two skill sets that I combine to really work on this particular endeavor. First I am a property manager, I started a property management company over 10 years ago. We managed 1500 single family residential properties in the South East, we’re headquartered out the Charlotte area. That company actually runs pretty much with two executives and a great team that run the company, but I understand property management, I understand the frustrations that we deal with when it comes to tenants. Then of course, I am a pet lover, and I like to say there are two Ps that cause property damage in its people and then pets. While I do love pets, really the pet owners are almost as big as a problem as the pet themselves. My firm has experienced a lot of issues with pets, we actually had two issues with dog bites back in ’15 and ’16 which made me take a closer look how we handle out pet diligence at my firm. And then we’re seeing a lot of “assistance animals” and I’m going to do the quotations mars, because while there is a huge population of people that really have disabilities and they need assistance animals, there’s a fair number of individuals that are trying to use that to circumvent the policies of property management firms and apartment communities across the country just so they can have their dog without paying a pet fee, a pet deposit, pet rent, or perhaps they even have a guard dog breed. I know property management. The other skill set that I have is I’m a North Carolina lawmaker. I served in the North Carolina House of Representatives and so I’ve built a reputation for understanding property management issues, and I get a fair number of pet related issues that cross my plate. While assistance animals are more of a federal statutes at the federal level, a lot of states are working on issues very similar because we get contact at the state legislator about assistance animal problems. Under the 80A Fair Housing Act, we still hear about it in state level. I really developed an expertise I think around assistance animals. I took those two skill sets and combine them and said, “Hey, there’s a problem in the industry, as a state law makes and legislator, I feel like I understand it very well.” I came up with this idea of pet screening. Here we are. We’re having a lot of fun. It’s really been a big success so far. John: All my life I’ve been an idea guy. I think the difference between me and a lot of people is I actually try my ideas and trust me, many have failed. I could have a whole comedy session on ideas that I tried that have not worked! But I think real entrepreneurs, they keep trying, they fall down, they stand up, they brush themselves off, and they do it again. Pet Screening, it’s really a win-win. We’ll talk more about it, but it’s really no downside quite frankly which is why I think we’re having such success. From single family, to multifamily, to student housing, to retirement housing, vacation rentals, everybody deals with pets and assistance animals. Those are potential clients of ours. Jason: Yeah. I attended the NARPM Broker Owner Conference couple of years ago as just a fly on the wall with my father who’s just starting his property management business because I wanted to see what went on there. Pretty calm. It probably felt similar to a librarian convention. It was placid, calm, but then they had this open discussion about service animals. And man, all of a sudden, you saw property managers come on fire, get alive. It was a heated discussion. John: You know what’s interesting, Jason? This is a true story because I want to give credit where credit was due. I was at that broker owner meeting, and it’s where they had the three microphones right across the room, and there are people mile deep at each microphone, and they had a gentleman there who happens to be the Assistant Deputy Director of HUD, Bryan Greene, who was I thought doing a fabulous job filing these questions. Jason: I felt bad for him. John: I know. But I am not making this up. It was in that room, on that day, that I said, “I’m going to go create a product to fix this problem.” That’s a true story. Jason: I love it, I love it. I was there when this was ignited in your mind. I run the DoorGrow Club Facebook Group. It’s become this phenomenal resource for property managers. The quality of people we’re attracting in there and the level of contribution is out control. We’ve hit as high as 16,000 interactions in a single month, which is ridiculous. I’m in a lot of Facebook Groups, let me tell you, and it’s probably the highest engagement Facebook Group I’ve ever seen. We’ve heard time and time again, people pitching or saying, “petscreening.com is this great service.” It comes up repeatedly in a positive light. John: We like that. First of all, I want to, again, give credit where credit due, thank you for putting together that forum. I am actually a member of your group. I see a lot of very healthy spirited dialogue, and I think it’s fabulous. I think on New Year, I said, “Happy New Year.” And I called you out by saying thank you for putting together a group where people can actually come and we call it experience share. They’re sharing their experiences, and they’re not holding any punches and it makes it authentic and makes it real. I think that’s what people crave right now, is they don’t want to spend, they don’t want a sales job. Congratulations on your success with it. Jason: Yeah, absolutely. I appreciate that. I’m really curious about how you went about getting this started because getting things started can be painful. Some people are nervous about being the early adopters. How did you make this work so well? John: Obviously, I explained my two skill sets, I told you how this idea popped in my head, where I was, we’re in fact I guess in the same room. The environment you described, I was there. I had a vision to really do three things. One, because I am in property management, I have so many friends who are in the property management space, we all face liabilities. As our companies grow, we’re big targets for claims against us, lawsuits, etc. I really wanted to develop a service offering that would reduce the liability for the property management firm, and also reduce the liability for our clients. Obviously, in the world that I live, the clients are the owners of these properties. That was number one to my vision. Number two is I didn’t want it cost a single penny. I didn’t want the property management firm or the owner of the property have to pay a penny for the service, which is really hard to do, but that was one thing I want. The last thing, because I’m an entrepreneur, I love money. Many people who know me, and I give presentations, I’ll start off by saying, “Hey, I love money.” I’m not afraid to say it either. I’m not a greedy guy but I love money and I think a lot of people feel that way but they’re scared to say it. Jason: I love money too, I love money too. John: There you go. And I wanted a product that could generate not just more revenue, but I use the word substantial. I wanted a product that could drive substantial, new revenue streams around pets. Because I felt like a lot of firms, and again, I’m picking on my own firm. We’ve been in business over 10 years, and we’ve had the same dang pet policy where it’s just x amount of dollars per pet. And I said, “There’s got to be a better way.” I wanted to drive a substantial new revenue stream. Those are my three goals. I hired a software development company. This is not my first foray in the software. I used to sell software at IBM corporation for little over 10 years, right at 10 years. I do have some familiarity with software. We just went and built a mighty team, and we used attorneys to help us, we talked to veterinarian consultants, I’ve talked to legislators like myself, lawmakers, I’ve even had conversations with HUD in DC, just about the topic. We basically made a whiteboard, we made a strategy, and we went and developed it. It took us six or seven months to develop it and test it. And then we rolled it out in 2017, at the beginning of the second quarter. We beta tested it with just my company, and once we got some user experience, I just worked out. Then I rolled it out to a select group of customers who I know very well, and just said, “Hey, if there’s a product that did this, would you want it?” And they were all like, “Absolutely. Of course I would.” I explained, “Guess what, I’ve created something that does that.” They tried it and they have been some of my biggest testimonials and now we have literally, Jason, hundreds of firms that are registered for our product across all spaces and we’re getting ready to launch into Canada. We actually have a big firm in Canada so we’re working through some treasury issues. A pet’s a pet, a dog’s a dog, a cat’s a cat. Doesn’t matter if they’re Canadian or from the US. They all can tear up a property, or they all can be good boys, good girls. Jason: This is a really well thought out, well tested, and you got some real, raw feedback back from people that you trust. You put this together. Explain what it is now to us, and then we can get the benefits of using this. You have these three things, you said mitigate liability, make it free, and make sure there’s a substantial additional revenue coming in as a result to this. Let’s talk about how it does this? John: Let’s take the free thing. First of all, we generate our revenue off of an application fee that is paid by the pet owner. If it’s an assistance animal, it’s $0. $0 to the assistance animal owner, and of course, it doesn’t cost the property management firm a nickel either. Assistance animal applications are always $0. If it’s a pet, a household pet, just like your dogs you just showed us a few minutes ago, there’s an application fee of $20 if it’s the first pet, if they have an additional pet, we charge $15 for any additional pet. That’s where we make our revenue. But, there’s a win for the pet owner because—we will talk that a little more your show—because they actually get a real tool that they can use with their pet for other facets of their live. They’re actually getting something. But first if all, it’s free for the property manager, that’s where we make our revenue. We do a revenue share with the property management firm. For every application fee that we collect that’s generated from a particular management company, we actually give a revenue share from each application back to the firm. Not only, Jason, is it free, but we actually pay a rebate per application and we pay it at the very end of every quarter. That to me is what I call office fund money. That’s not the substantial revenue that I’m talking about, that’s just fund money to take your office stAff out to a bowling party or something like that. It’s free and we’re going to give you a rebate. The tool, there’s two things. We have pets and assistance animals. Let’s talk about pets first. When someone comeS to the tool, they’re going to have a dog, a cat, we have birds, we take all kinds of pets. I would tell you 99.5% of the applicants are dogs or cats. We basically provide every firm a unique pet screening link. Your firm, Jason, I know you don’t do property management, let’s say you did, you would have a unique link that’s separate from another firm, from another firm. The reason they all have their own PetScreening links is because they give their link to their customers, and when they click that link, it takes them to PetScreening and that’s the way we track where the applications go back to. Every firm gets their own unique link. Once a firm has their link, they give it to anyone that says they have a pet or an assistance animals. The same link for everything. When the applicant clicks on it, of course they go to PetScreening even though it’s being tracked back to the firm that referred them. They would just start filling out the application. What’s really unique about our product is we collect the obvious things, we collect the name of the pet, what kind of pet is it, what’s the breed, we get photos. First of all we just ask if the pet is vaccinated, then we get vaccination records such as documents and the details. We’re asking if the animals are spayed or neutered, if they’re clawed, or declawed, or have nail caps. We ask very common sense questions on the animal itself or the pet itself. But we’re still going much deeper than most property management firms are just doing already. But then we go into a whole another section, this is why I think attorneys and compliance officers really love the product, is we have a section, we call it our affidavit section. We ask a lot of questions, they’re yes or no questions. But the pet owner has to answer yes or no. These questions are really written to protect the property manager and to protect their owners. There’s probably 15 questions, but they’re things like, “Do you keep your pet on a leash at all times except within enclosed fenced area?” That’s a very simple question. Yes or no. You’d be surprised how many people say no, and then we’ll ask why, and they’ll say, “Because my dog is well trained.” That might be true, Jason, but from a liability standpoint, and from a risk perspective, property managers want to rent to people who are willing to make sure their pets are on a leash at all times when it’s not in the backyard. But the applicant is jut answering these questions honestly. Yes, no, yes, no, all the way down. And then, when they go to submit their application, it gives them a chance to attest and certify that their answers are accurate. This is the affidavit part that our attorneys really love because we’re giving them officially on the record that the information they’re giving us is accurate. If they’re lying, the property managers are still protected because not only are they lying but they just said that they knew they were lying. Then they attest to that and then they submit payment. Now, this is really where our product is cool. We actually created a very complex algorithm that takes all these data points based on their application and we basically create a pet score. Very similar to a credit score, Jason, for humans, but we’re giving a unique pet score for that exact animal, that exact pet for that exact application. That pet score only goes to the housing providers. The reason that’s important is because now, when somebody comes with a pet, you’ll get to know what are the risk factors for that pet and there’s a score that will be given for. You can use that score Jason, this is the substantial revenue piece, you can basically create a pricing matrix for pet rents, pet fees, that correlate to the score. Basically, if the pet says, “Yes, it’s vaccinated,” but they fail to put in proof of it, they’re going to get a lower score. The fact that they said it’s vaccinated protects you as a property manager from a liability standpoint, but there’s no proof of it, therefore they should get a lower score which means you should be able to charge more pet rent. This is where firms across the country are able to use this scoring to drive substantially more pet revenue. Jason: Tenants that are going through this, the residents going through this, are they aware that these things are going to impact their scores so that they’re doing the work to get vaccinations and get in alignment? John: First of all, we don’t necessarily keep it secret that they’re being scored. But we don’t advertise it, we just make them fill out an application. When they’re going through their application, when they answer the question, even if they give an answer that’s not favorable in the tools opinion, it still gives them a green check mark that they answered the question. They’ll just finish their application and submit it. But on the other side, when a property manager gets it, that green check mark, if it’s not a favorable answer, that green check mark goes to a red X and then the score is indicative of that answer. Then we list all the factors that really derive the score. What that means is this is where property managers are building better relationships with their pet owners because they’re picking up the phone and call in their pet owners say, “Look, I just got your results from PetScreening, I see that you said your dog’s vaccinated but you didn’t put any vaccination records. I’m going to have to charge you a little bit more but if you actually go in the tool and upload it, then I might be able to charge you less. I tell property managers, “Be careful about talking about the scoring because they don’t really know they’re being scored. But you most certainly can talk about in terms of result. The results are showing that your dog is vaccinated because you said it was but we’d like to see some proof of that.” What happens is they can log back in and edit their application, upload that data and then it rescores instantly. There’s some way that build some good faith there. The scoring Jason, KISS stands for keep it simple stupid. We borrowed Google’s metric of 1-5 stars. But instead of stars we use pet paws, pretty clever. A 5 paw score is very hard to achieve, about 11% of our total applicants get 5 paws. We are not handing those out like candy. But if you have an applicant that has a five paw pet, I would probably tell you you would charge them the cheapest rate you have because that’s a two thumbs up type pet. If you get a one paw pet, the beauty is a one paw pet doesn’t mean you’ll say no. Maybe you will say no, it’s up to the property manager how they treat the scoring. You may get an animal that’s just a puppy, that’s not neutered, that isn’t potty trained, that would probably be a one. But you probably would still rent to them, but you should what, Jason, charge more. Guess what puppy, they gnaw on everything, they pee everywhere. You can see how that scoring can work and the property manager makes that decision. We never accept or decline pets, we just give the score for property managers to interpret to their policies. Jason: We’ve talked about the scoring system, we talked about the benefits for the property manager. I think you are going to touch on the benefits to the resident, I think you touched on that a little bit. What else are we missing? John: Let’s talk about the assistance animal side. Everything I just talked about was for pets. That’s about 90% of our applicants. We have about 10% of our total applications fall into the category of assistance animals. Assistance animals are defined under the HUD and the Fair Housing Act as service animals, companion animals, emotional support animals, therapy animals, you pick the buzzword, they all fall under this category called assistance animals. The applicants have a choice to choose whether it’s a service animal, and a service animal’s unique because it can only be two types and it has to have specialized training. If they choose the companion animal, which is the other bucket for all the other categories, then they don’t have to have specialized training and it’s open to any type of animals. For example, as silly as it sounds, a pig could be a companion animal but a pig could not be a service animal, because a pig does not qualify under service animal definitions. But what we do, we take this headache, Jason, completely off the plate of the property manager. All the property manager or the property management firm or the apartment community, they just send them to PetScreening and we collect the data, our tool asked the HUD permissible questions, we asked for the data about the reviewers, we collect the documentation from their third party reviewer which doesn’t necessarily have to a be a doctor, it could be a social worker, it could be a councillor, it doesn’t matter, there’s no exhaustive list but we collect that data. And then with the legal review team, they will get every single assistance animal application individually. That is not automated, and there’s no score. That’s very important, Jason. Scoring is never given to assistance animals because it’s either they are recommended or not recommended. John: It’s totally filtering. It’s like the Waze app, if you travel with Waze and you get a user that reports a cop two miles up the road, what are you going to do? You’re going to slow down. These users are coming to the tool and our reviewers are asking for more information and they don’t know what to do because perhaps, maybe, we don’t accuse anyone, but maybe it’s not exactly an assistance animal and they don’t want to spend anymore time on it, and they go somewhere else. I like to say we are really disrupting the industry. I have assistance animal owners that are coming to us going, “We love this product because we feel like you’re actually weeding out the people that shouldn’t have them.” That’s pretty neat. Jason: What are the legal ramifications if they went through the process that they lied to get their animal approved as a service animal? John: Obviously, what we do is we collect the data and we collect the documentation, and then our legal review team, they work to validate. There’s this thing called Test of Reasonableness. We are looking is the documentation reasonable? When was the document issued? Who is the provider? And we will research the provider, even make phone calls to see if that clinic really exists, to see if that PA really issued the letter, we get a lot of military issued letters. We’re doing the diligence so that property managers and apartment communities and all these housing providers don’t have to. Really, the legal ramifications are if they lie, there’s really no recourse, there’s a whole movement going on in different states that are putting fraud statutes in place, but a lot of it is more on the 80A side, Jason. 80A is more on public accommodations. I’m not seeing a lot of statutes that really talk about fair housing. I do think that people know that this is being taken advantage of, but understand, this is a legislative issue. HUD is doing the best they can, HUD is an agency, they interpret policy, Jason, they don’t make policy but basically, they’re doing the best they can. I’ve talked to HUD and HUD is waiting for everything to be adjudicated. There’s not a single person, Jason, that’s going to raise their hand and say, I want to be the guy that’s in the courtroom trying to figure this out. Instead, they can rely on our firm and we are working within the guidelines. As a state lawmaker, you can imagine, I take this very seriously and we’re excited about it. When I tell you we have customers raving, I’m not exaggerating. Just this week alone, we have two applications that came through as assistance animals, and they came back and said, “You know what, I’m going to convert it to a pet.” Now they’re going to convert it to a pet, they’re going to pay the pet fee, and that housing provider can actually charge them pet rent. How awesome is that? Jason: The time factor and time cost money. You’re paying your staff, or your time could be focused on better things. Do you have any idea of how much time is this typically saving property managers? John: I can only use my firm as an example. I’d say probably more than the time factor, is just the liability factor. Time is important but let me tell you something, property managers are not fair housing experts. They’re scared to say the wrong thing. Imagine someone getting on the phone trying to answer questions and that someone says, “You can’t ask that.” A property manager is going to look like deer in headlights and not know if they can ask that question and not ask that question. The beauty is they don’t have to worry about it anymore. They just send them to our product, and we do it. Of course, in order to get this service, you have to give us all your pet business because we don’t make a nickel, in fact we lose money offering this service but we know that as a bundle, helping property managers with their pet diligence and giving them that scoring so they can make more combined with helping them with their systems animals as a package. We are basically taking over firms complete pet business and we’re getting more diligence than a property management firm has ever done. If you go to the questions, Jason, we’re asking things that I promise you, property managers have never even thought of asking. Every question was built to protect the property manager and their owners. What’s really cool, this is really important, because we have created the first nationwide database where property managers can actually report pet damage. I want to give you an example. If you have a pet that moved into a property, and you have a pet profile on them, and a year later, let’s say it’s a cat they move out, and you do your move out inspection and the place smells like cat yarn, which is bad, you’re going to have to replace the pad, maybe even the sub floor, deepening how bad it is and carpet. That’s an expensive venture, right? You can actually log into the tool, go to that cat, that particular pet profile, and you can log a pet damage incident report and now that incident report will follow that cat forever and that owner. When it goes to try to rent something else, that’s going to show up as history. We’re creating the first incident reporting on property damage and pet bites. If you have a pet bite in a property, you can also report a pet bite. For property managers who rarely have a chance to have their say when it comes to tenants, because we don’t want to be ugly. This isn’t being ugly but you’re having a chance to get something on the record for damage or pet bites so that everyone else can see it if they’re interacting with that particular pet and pet owner at a future day. We’ve really created something again that’s disruptive, it’s revolutionizing the pet industry because we’re going to have the first nationwide database of all that data. Insurance companies are interested in it. I could really go on of all the different sectors that want that data, but we’re collecting it. Property managers are a source of providing it. Jason: This is protecting property managers. The tenant, if say they’re applying to multiple properties but they have one pet, how many times do they have to fill out the application then? John: Great question. Let’s talk about the pet owner. They win. Yes, they got to pay $20 or $15. But let me tell you what they get out of it. First of all, this is portable, this is not like when you go to a property management firm or an apartment community and you make a credit application. If you don’t get the property or rents before you could finish the application, I hate to say it but you already wasted your application fee. You can’t pour that across the street to the other firm. Beauty is if they go to one firm and apply and they ask them to go to PetScreening and do a pet profile, if they don’t get that property and they go to the apartment community across the street, the pet owner can share the pet profile or profiles, if they have multiple pets, they can share it with the next apartment community, and not have to pay anything again. That allows them to use it in different ways. Think about all responsible pet owners. I’ll pick on my family. We like to go camping. I have a pet profile on my dog and campgrounds are pet friendly, but they’re wanting to see copies of rabies certificates. Now, a pet owner who has a pet profile can log into the tool and can forward their pet profile with a clickable button and putting in an email address and the entire pet profile will go to that dog groomer, that dog walker, that camp ground, that vacation rental owner, and now they have that dog or cat’s information at their fingertips minus the scoring. The scoring is only for housing providers. That’s very important. The scoring will never go anywhere else. But for everything else, pictures, shot records, microchip, etc., that can be forwarded by the pet owner. That’s very powerful because response with pet owners having neat dashboards and manage their entire pet and they get it for the $20 or $15. At the end of the year, they need to renew it. This is important, in the property management industry, most people who rent, Jason, to a tenant for three or four years, they don’t ever really revisit the pet. If they stay there, they’ll do a property inspection, they’ll look at rent comps, but our tool is forcing property managers in a good way to make these pet owners revisit the pet, because a lot can happen in a year. In a year, a dog might have bit somebody, when the renewal time comes, which is a year later, that pet owner has to go back in and reanswer all the questions including behavioral questions. Yes, it’s bit a pet or yes, it’s bit an animal, yes, it’s bit a person. Now, the property manager has more details and they get that data every year and we charge a $10 renewal fee to the pet owner and then we do a rebate share on the renewal as well. We’re really changing the game, not only for new applicants, but for existing tenants who want to stay another year. Because property managers, they really need to reevaluate the data because a lot can change with pets. Jason: Alright. Is PetScreening.com profitable yet? John: It’s a software product so we have, as you can imagine, I made a large capital investment in the software. We’ve had 265% growth since we stated the product. We have hundreds of customers. Jason: You’re not afraid of the future. John: It’s amazing! I think we’re onto something big here. No joke. Jason: I think you are too. Fantastic! Is there anything else that people should know about petscreening.com. We’ve approached the pet side, we’ve approached the assistance animal side. John: I would say there’s one last thing that we haven’t talked about and that’s around the documentation for assistance animals. We’re not hospitals, we’re not health care providers, but there is this law called The HIPAA, and it’s really for health care providers and that’s protecting a sensitive medical documentation. We’re property managers, we’re afraid to give you that documentation because that’s part of the documentation we’re allowed to ask for when it comes to assistance animals. The problem is property managers, they’re taking that data, they’re scanning it into a PDF, they’re putting it in the file, they’re uploading it to their software vendor, and it might not be really protected. The beauty of our product is we have HIPAA Compliant Servers, all of that documentation, these letters, they’re very frank. Sometimes it’ll say what their disability is, and we don’t want that data getting out there. We like to say we like to save housing providers from themselves, that data stays in our tool, and the only people that can access it at a firm are the admins of a firm. An admin of a firm can basically not give access to all their property managers because there’s really no reason for a property manager to look at ones medical records. We’ve really thought this product out and how to protect property managers from themselves when it comes to dealing with sensitive documentation. In summary, Jason, it’s a free product, we give you a link that you just basically takes two minutes to sign up, you use that once you get your instant screening link, that’s for your company, you put that on your application process, you put it on your website, you make sure anyone with a pet or an assistance animal uses it and then you’ll be notified when one comes through, you’ll have the scoring, you can charge more if you want to, you don’t have to if you don’t want to, it’s up to you. We do your assistance animal validation for you, takes that off your plate, and we pay your rebate. There’s really no downside. I hear all the time this it’s too good to be true. But we really have a tool here that’s a win for the pet owner, a win for the property manager, a win for the property owner. We’re excited to have it. Jason: I love it, love it. Jason: To check this out, how do people find it? It seems pretty obvious but I’ll let you say it. John: I want to make sure that we help all of your listeners. We have two ways, I’ve already sent you a link that you can put for all you users. You can share the link that I’ve created for you so that way I can make sure… There’s really not a lot of integration that needs to be done, but I’m willing to pay and it won’t take more than an hour. I’ll pay you for the hour. It’s about $300 and I’ll pay for it because it’s not me doing, I actually hired a company to do this. If they need integration help, I’ve got the guy who’ll do it, and I will pay the bill, and I’ll do that for all of your users. In order to get that though, they need to come through the link that I sent you because that’s the only way I know to give them that special if you will. I’m happy to do that. John: Absolutely. I don’t mind doing it, and I don’t mind spending another $300 because we want it to be done right. But I’ll tell you, not many people need the help. This is not hard to do, you get the link, you put it on your website, you put it in your application, but if they need the help, we’re happy to help. They’ll go to the link—and I think you might have just posted it—and once they click on that link, they can send an email to info@petscreening.com. If they want to have a one on one call, our customer service is through the roof. We pride ourselves on helping property managers and even pet applicants. Like I said, that’s very important to me. One of my CTOs says, “John, you know what’s better than excellent product? Excellent customer service. That’s even better than excellent product.” I take that to heart. We’re here to help any way, email us, click on the link, we’ll make it easy. Jason: Awesome. We’ve got the link below here, for those listening to this later, the link would be on whatever pages we post this on. Sounds like an awesome win-win-win all the way around, for all parties involved. Like I’ve said before, we’ve heard nothing but positive feedback. John, I appreciate you coming on the show. Jason: It’s always exciting for me to connect and communicate with other entrepreneurs that are probably as crazy as I am. I appreciate you for coming out. John: Absolutely. Hey, happy new year to you and to all of your listeners and thanks for all you do and leadership in our industry. It’s most appreciated. John: Thank you guys. See ya! Jason: Bye! Alright, cool. Really exciting to have John come on. If you enjoyed this episode, be sure to join the DoorGrow Club Facebook group. I have the link active right now that he was talking about if you go to doorgrow.com/go/petscreening, and if that changes, we’ll make sure it’s down below on wherever we put it, but you can go to that link. John’s thrown out a discount, I love when people surprise me with stuff like that on the show. Make sure you also get into our DoorGrow Club, we have links to that and other excellent vendors in a document, it our Facebook Group for DoorGrow Club. You can go to doorgrowclub.com, that community is only for property management business owners, the entrepreneurs, you have to apply to get into it, it is free but we do want to keep that community tight knit, closed, and hyper relevant, so it’s not for your staff, not for your team members, but it is for you, the business owner so that you can connect with like minded entrepreneurs. In the file section of that Facebook Group where you have a document there of vendors and tools, and you can go through that, it’s a list, an open source sort of project where we’ve been building out all the best tools, and vendors, and PetScreening is absolutely on the list! Check that out. I’m Jason Hull with DoorGrow. We’re going to be launching a conference and doing some other cool stuff in the future so make sure you are in the DoorGrow Club, paying attention to the cool stuff that we’re doing. And we will talk to you guys soon.